Alexander's music has variously been described as bebop, calypso and reggae. But after 50 years in music and more than 70 albums, he's earned the right to call his music simply his own. Alexander grew up in Jamaica playing the piano and the accordion, and he was versed in the up-and-coming popular music of the island. "When I left Jamaica for the first time in the early '60s, there was no such name [as reggae]," Alexander says in an interview with "All Things Considered" host Audie Cornish. "And they had just begun to label that other music ska, Jamaica ska, and I was one of the musicians playing on those early recordings. I was about 15 years old." After moving to the U.S., Alexander found success on the jazz club scene, playing with several heavyweight artists on his way up. In his quest to fit in, Alexander says his calypso roots took a back seat for the early portion of his career. "When you come from another place and you have a chance to get in with the folks of whatever avenue you're going down ... you're trying to fit in, and in order to fit in, you have to leave your stuff behind," Alexander says. After many years and visits back to his native Jamaica, Alexander began to incorporate sounds from his homeland into his music. "I left the calypso and the island rhythms behind me, but they were always there in the back of my brain," Alexander says. "And years and years go by, and then I started to go back to Jamaica more frequently, and I realized how much I really loved home, and I started to bring back the roots rhythms." The result was a multifaceted sound that eludes genre categorization and, consequently, a name. 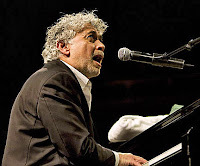 "Monty Alexander music, that's all I can come up with," he says. "I have so many different directions that I can go in and make something out of it that I'm constantly being motivated by that. So my music is alive, it's right now, it's here and now. That's it."